Southern Exposure largely survived the devastation of Hurricane Irma, save for our cabana, the separate 1-BR/1-BA unit destroyed in the storm. However, the main house, with its two levels featuring three bedrooms and three bathrooms, along with the kitchen, two large living areas, and (most of) the surrounding decks, not to the mention the pool, have all survived intact and been restored. We are on the rental market again beginning in January, 2018, and we welcome your inquiries. We are ever mindful of the old trope that what doesn’t kill us makes us stronger! “Great island home, with a beautiful view. The location was ideal for us, quiet with a short drive in to town. Spacious deck with nice pool. Ideal for days we were not going to the beach. We stayed post hurricane and would not have known this place was affected. Well managed home”. We enjoyed your home and it accommodated all 9 of us. Hope to be back. Had a lovely time… Then, from one of the children: We like the pool!! I hope the next lucky people to get this house have a good time too! And we saw some lizards! They were sooooo cute! Sunshine, showers and finch (bird) visits here at Southern Exposure are a morning delight that will stay in our memory… We loved staying in your nice villa and hope to return! Just wanted to say thank you for sharing your St. John home with us. We loved the island, and the house was perfect for us, spacious and well-equipped. The kids loved the pool, and we loved the view! Back to the house, there was more than enough room for my husband and me, our three boys (ages 8, 6, and 4), and our teen-aged babysitter. In fact, we never used one of the bedrooms. The house was clean and well-maintained and was accurately described in the listing and photos. The owner was very friendly and helpful in answering our questions via email and providing information about the house and St John in general. The pool setup is good for young children because the pool is about three feet higher than deck level (accessible by stairs and a ramp), so it’s less likely that a kid would accidentally fall in. Our boys played in the pool every day and loved it. The view from the deck is beautiful!! I would definitely recommend this property to others, especially families with children. Mike and I enjoyed numerous sunrises and sunsets – we now know and understand how you must pine for this place during our harsh Indiana winters… We love your home! Your place was great – felt like home and had everything we needed. The view was great and we enjoyed evenings sitting on the deck. The personal touches were welcoming and the kitchen set-up made it easy… We thought the location was private [and] was a great spot as home base for traveling throughout the island. This was our second visit to St. John. We had a crew of 9 and this beautiful house fit us perfectly! We all enjoyed the pool, lounging on the deck and taking in the amazing view. Thank you for sharing your amazing home… There were 7 in our family and everyone was very comfortable in this beautiful home. The views are amazing, the kitchen very functional, and the living quarters comfortable and well appointed. – Peyton, Susan & Todd B.; David Elizabeth, Ashlyn & Chris N., Essex, VT. I highly recommend Southern Exposure!… and Mark (property manager) has been great, very responsive to our needs. We enjoyed your home and it accommodated all 9 of us… Hope to be back. We had such a wonderful time. Southern Exposure is a lovely home and we are so happy we got to see it. Southern Exposure is a wonderful home and [the property managers at] Seaview were on top of everything. Thanks so much for all the hospitality. The books [in the house] were very helpful. Thank you so much for the wonderful house. It was everyone’s first visit to the island and we loved it! We appreciated all the comforts of home and the well-stocked kitchen. Our third trip to St. John… Great house! Celebrated our 40th anniversary on St. John… Enjoy the house! It’s great for total relaxation – the pool is perfect for floating. – Carolyn & Eric H., & Steve and P. B. Southern Exposure far exceeded our expectations. It was wonderful and helped to nourish our minds, bodies and souls. Thank you for… sharing this very special place. What a great place to spend the last week of the first half of my life (I turned 40 here). What a wonderful holiday in an amazing place to call home. Thank you so much for sharing it with us. Your wonderfully appointed house made everything so much easier, from identifying fish to answering island questions – the various guide books were invaluable. We even used your cookbooks to serve our friends an “authentic” Caribbean meal! What fun to read everyone’s reaction to the beauty of Southern Exposure [in the house guest book]. I love the pool, and the shell & rock décor on the deck and shower. You have a beautiful, comfortable, well appointed home with fantastic views. We enjoyed our stay — our 8th visit to St. John — at Southern Exposure, and one of our best. And the folks at Seaview were fantastic – very accommodating and helpful. This is our seventh trip to St. John… Southern Exposure was a perfect retreat after long days at the beaches. Thank you for a beautiful villa, and thanks [to Seaview] for being a caring and helpful management team. For the over 60 crowd, we passed up the snorkeling but thoroughly enjoyed the views… eating out and cooking on the house’s Weber [grill]. Thank you for sharing your beautiful home. We had a great time there. Our first visit to St. John. We will definitely be back and will see if Southern Exposure is available. Your home is wonderful, comfortable, and fit our needs to a ‘T’. The view is great and the pool refreshing. Thanks again for making your home available to us. We loved the layout and pool and views. This home was perfectly appointed too! …Will look forward to return here – this island, this home. Spent our 25th anniversary here. You have a lovely home. Southern Exposure will always have special memories for us. Thank you. We had an amazing week that we will always remember. The house was so well equipped with everything we could need and very well maintained too. The house fit our needs perfectly while the view was breathtaking and the breezes lovely… Cooking dinner on the grill and sitting on the huge deck under the stars every night was one of our favorite parts of the trip. Thank you so much for sharing your home with us and making us feel welcome here in St. John. Southern Exposure is breezy, tranquil, comfortable and so picturesque it takes the breath away. Mornings, mid-day, starlit evenings – all equally splendid and magical. We have fallen in love with [your] villa, and the island as well. Thank you for letting us [enjoy] this wonderful villa. Your many books on St. John were much appreciated and enjoyed! Our vacation on St. John at Southern Exposure has been fabulous. We really enjoyed the comfort and relaxation of this home away from home. The view is beautiful. Thanks for sharing Southern Exposure with us… we hope to return soon. What a wonderful house, what breathtaking views, and what a truly perfect place to spend a vacation. Everything was so comfortable and easy on the eye – you really do have your own little corner of paradise here. And [Seaview] are wonderful property managers! This was an amazing place and the house was beautiful. I’m gonna miss it! 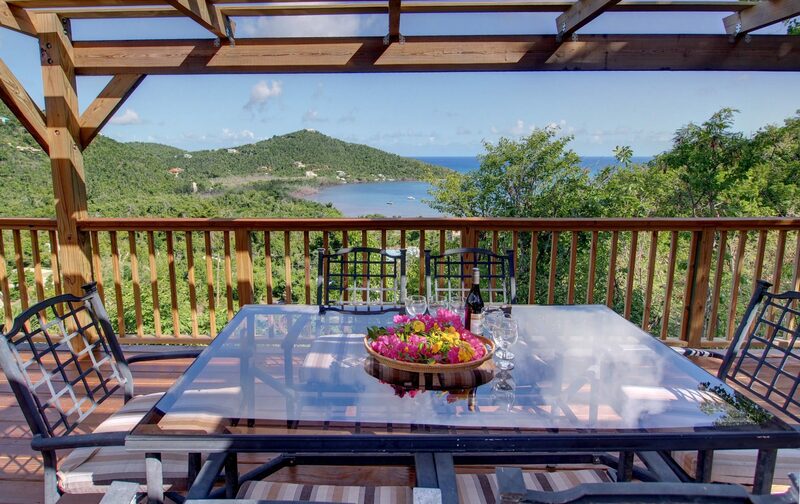 Our 9th trip to beautiful St. John… a spur of the moment deal… it was meant to be. The villa is great and we will come back to it in December for two weeks. Read the books in the villa…. very informative. This villa had everything we needed and [was] so very comfortable. Property managers [Seaview] were great help. This is as close to paradise as you can get. Home away from home. Our group of six had a wonderful time here! The villa was very comfortable and was stocked with everything we needed. The view was absolutely spectacular and the deck was so relaxing. We all agreed that we must come back. The equipped kitchen was very appreciated as was the interior and the landscaping. Hope someday we will be able to return. Your home is beautiful! We enjoyed our stay here so very much! The décor is wonderful all the way from the outdoor shower, the colorful bedrooms and all the beautiful Caribbean furnishings. Thank you for sharing with us – our vacation here in St. John was near perfect. We will be back. We truly enjoyed your beautiful well-appointed villa – the pool, eating outside under the stars, and the super stone & shell shower. I love the periwinkle blue color in the master bedroom [cabana] too. My husband and I had this whole wonderful house – and its fabulous views – to ourselves! Such a great place! We had such a great time and able to relax, and it’s so nice to have a place with such nice cooking equipment. After a long snowy New England winter, this was exactly what we needed. The house was beautiful, we enjoyed the pool so much that we too, like others who stayed here, found it capturing us to stay poolside. This is our 3rd year vacationing on St. John. Your home is absolutely lovely – a wonderful respite from the frantic pace… in New England. Thank you for sharing your home away from home. This is a perfect spot. The décor is perfect! This is my first visit and your home made it a very memorable one. The colors you have chosen along with the furniture and artwork make your home a very lovely, warm, inviting place. While I loved the beach… your pool provided a lovely retreat in the early morning hours and in the hot afternoon. Thank you for such an inviting place! What a beautiful villa! Your house and pool were so great that we spent long lazy days swimming and sunning and realized that we had not left the house in TWO days! This was just what we were looking for. This is our 5th time on the island and this is BY FAR the best place we stayed (love the colors!). We will be back! Beautiful views – comfortable and wonderfully equipped villa – and terrific weather. This is a great escape from the crowds… Enjoyed the visit! We had a wonderful time. The villa is beautiful and very comfortable – and the view is stunning.